Two cars in the garage were destroyed. A heavily traveled road in Casco reopened Thursday night around 9:30 p.m. after firefighters from six towns extinguished a fire that destroyed a two-story garage. 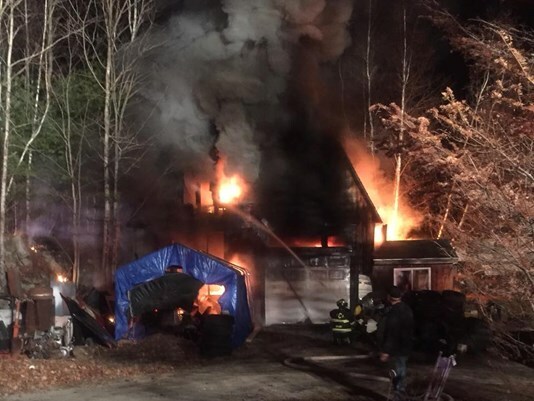 Casco’s Deputy Fire Chief Brian Cole said the garage at 340 Poland Spring Road, also known as Route 11, was engulfed in flames when crews arrived around 6 p.m.
No injuries were reported, but two cars inside the garage were destroyed. The garage belonged to former Casco fire chief Norman Judkins. Judkins says he kept several cars and parts in the building. Cole said the cause of the fire remains under investigation.